The rental price shown ($18) is per foot/month of overall boat length for an annual lease. Shorter leases are available. 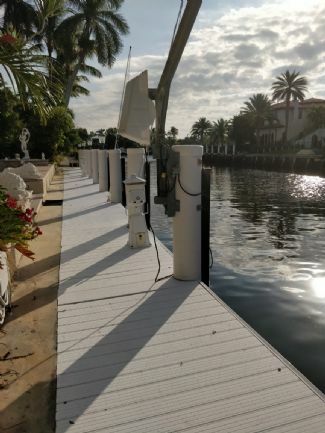 Dock can accommodate up to 110 ft boats in a deep water and well protected beautiful and quiet area. Second dock in the canal from the ICW (see picture). Fastest route to the ocean is approximately 5 minutes thru Hillsboro inlet, only one bridge away from the Ocean (no fix bridge). Space for parking on site, shopping center, restaurant and grocery less than 5 minutes' walk. Full time live aboard is not permitted but open to discuss shorter term stays or vacations and crew are allowed. Pool access possible but need to be discussed. Ft Lauderdale international airports is within 20 minutes' drive and the Bahamas are only 50 miles from the coast. Shore power available (at extra cost for heavy load boat) 120-240 60 Hz up to 70 Amp.